Posted Friday, April 1st, 2011 by Greg Gladman. Even the best printers can experience problems from time to time. If you find yourself constantly having to clear paper jams, deal with misfeeds, or you find that there are streaks on your printed pages, it may be a good time to try cleaning the rollers. The roller mechanism includes one or more wheels that grab the paper and feed it through to be printed. If the rollers get coated with oils or other substances, they may not grip as well, causing misfeeds and paper jams. They can also become coated with dirt or other substances, and transfer it to the page, causing streaks. It is a good idea to clean the rollers at least a few times a year to prevent these issues. Power down the printer completely, then unplug it from the wall. Disconnect all cables as well. Remove the ink or toner cartridges to ensure that they are out of the way during cleaning. Remove the input paper tray and the paper contained within it. 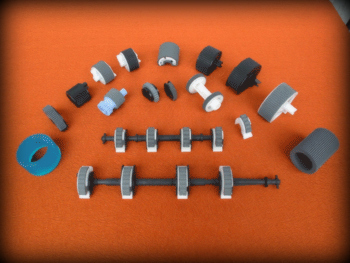 This should give you access to the rollers, which are generally made of rubber-like materials and located near the input tray. Dampen a lint-free cloth slightly, and gently rub the surface of the roller to clean off any residue. Turn the roller with your fingers to access more of the surface, and repeat the process until you have cleaned the entire surface, then move on to the next roller. If the surface of a roller contains grease or other substances that are resistant to water, you can use a small amount of rubbing alcohol. Use this as a last resort, however, as it can sometimes dry out the roller material. The video below illustrates the cleaning process for a model with a top-loading tray, but uses alcohol pads, which are only recommended as a last resort. It provides a good illustration of what the rollers look like, however. Here is an example of a model with a lower input tray. Note that it is generally not necessary to remove the rollers in order to clean them, however. Once you are finished cleaning the rollers, you can reassemble the machine, plug it back in, and test its operation. You should now notice a reduction in paper jams, misfeeds, and other issues. By taking the time to clean your rollers a few times a year, you can even prevent many of these problems before they happen.